Recent advances in broadcasting technologies have brought down the cost of live event video streaming, a component and can add great value to your event. attend2IT specialises in high-quality IP broadcasting from camera to viewer, but we are happy to offer part of the service and link to your existing camera supplier and/or CDN. We can mix as many cameras as you need, in Full HD or 4K resolution. With a mix of manned, stationary, or remote-control cameras, you can rest assured that we will have all the action covered. Our 4K hardware mixers allow great diversity when switching live video streams. With built-in features such as mix effects, chroma and luma keys, adding lower thirds or titles live is quick and easy. We can stream the footage over our leased satellite system or venue internet connection to our dedicated CDN (streaming servers) at the best possible bit rate in order to preserve quality. When cameras are too far away from the vision mixer for a direct HDMI or SDI connection, we can transport video and audio over fibre optic cable or long-range Wi-Fi up to 10 Miles, meaning that you are free to place cameras wherever you wish. We encode our footage on-site once to preserve bandwidth, making the service considerably more affordable. Our encoders support a wide variety of formats, at the best possible quality. We can also record a lossless version of the footage for your archives. Our cloud servers process the incoming video stream and re-encode to multiple formats – so that it is accessible on multiple devices and internet speeds. The stream is distributed through our global CDN to ensure that any number of people can view the stream at the best possible quality. We support YouTube, Facebook as well as most major CDNs, should you wish to use your own. You can use as much or as little of our service as you require. If you have your own cameras and switching gear, or your own streaming platform we can fill in the gaps! Our streaming platform works on all modern browsers and devices. You can watch on your laptop, desktop, mobile phone, tablet or smart TV. Need 360-degree streaming? Footage can be streamed to an app, password protected, or can be used to capture user data by filling in a survey before the stream. Because we develop all our software and streaming products in-house we can do this for you. Get in contact to discussions your requirements. If you are looking to stream to lots of devices in the same location then you might consider our synchronised streaming systems. One of the more common requirements of our customers is to join two sites together. We can do this in a number of ways depending on various factors. We have a large stack of video conferencing units which allow for seamless two-way audio and video in HD. Quick to deploy and affordably priced, these are a popular solution and also work with our satellite links. One of the reasons many streams fail is due to poor connectivity at the venue. Unrealistic upload speeds are required by a lot of our competitors. We can work with venue connections of 2Mbps (or less if required). 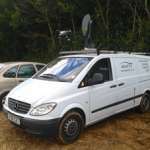 However, if the quality is important then we can utilise our fleet of flyaway and satellite-based systems to offer HD streams in venues with no connectivity at all.